With spring in the air in the Northern Hemisphere, it's easy to forget the number of environmental hazards that often come along with it. Dust, pollen, and other seasonal annoyances can take a pleasant spring day and turn it into a sniffling nightmare of hay fever. But it can also be much, much worse, and that's where tools like Aroma Technology's NEXTToMe system can come in handy, sniffing out some of the worst environmental hazards before they can become deadly. 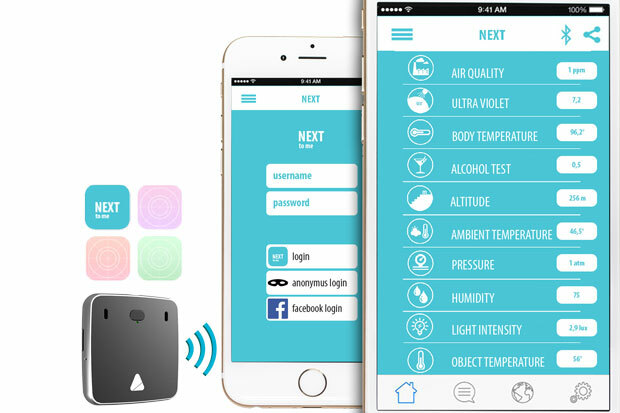 The NEXTToMe system incorporates 10 separate sensors, each one scaled to check for things in the environment that can have an impact on health and safety. For instance, one sensor is devoted solely to measuring blood alcohol content, just the kind of thing someone would want on hand when going out for an evening and deciding whether or not to drive home. There's another that measures for carbon monoxide, another for body and object temperatures, one for humidity, air pressure, UV radiation, ambient temperature and more. The device works with an accompanying app to make it easy to check several different indicators and ultimately make decisions from there. The device that contains the sensors is said to have a full month of battery life, and can provide beyond that a full two weeks of “operational mode” where three sensors work simultaneously for 15 minute intervals. The battery can be fully charged in just under an hour, making it even more efficient. Usually worn on the wrist, the NEXTToMe device comes with several different wristbands, and those who don't want it wearable can actually attach it in other ways, including to clothes or to key chains. Those interested in getting hands on one of these may have a wait; the device is currently running an Indiegogo campaign in a bid to raise $50,000 toward the device's development. Right now it's at $764, but that's after less than one day. Plus, it also seems to have a flexible funding option, and will likely stay at a surprising bargain price; early bird pricing on this is $89, down from the final retail price of $149. NEXTToMe has an interesting system on its hands, and reaction to this should be mixed. While some will doubtless appreciate the ability to measure the various potential hazards in our environment, others might consider this intrusive beyond belief. Since the device gathers data from sensors and, according to its Indiegogo page, puts all that data in the cloud for everyone to see, it's enough to make one wonder how it will be used. There's an anonymous login, yes, but there's also a Facebook login. Will we see insurance companies requiring the use of such tools, for example, and then raising premiums when a user's blood alcohol content measures too high to drive, even if that user doesn't drive? Will child protective services descend on a house where a NEXTToMe unit detects unsafe levels of carbon monoxide? There are great possibilities here, but also deeply disturbing ones. Only time will tell how the NEXTToMe system is received and put to use, but a system like this has a lot going on therein. This could be a terrific new development, or an intrusive disaster, depending on how it’s used.